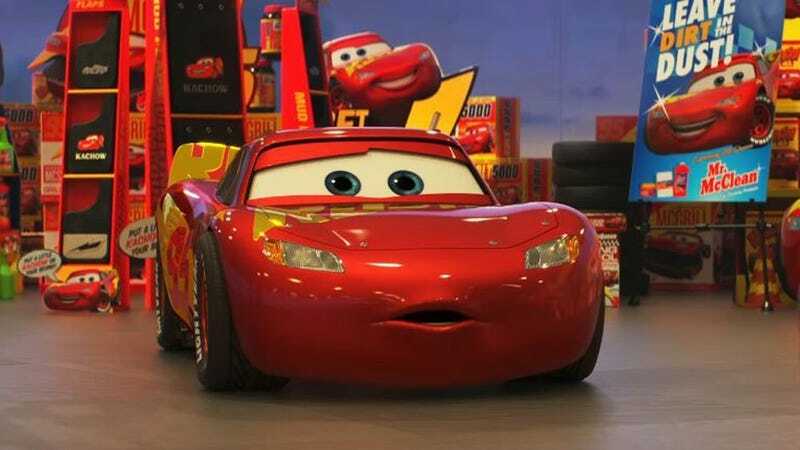 If there’s one constant truth in the Disney Pixar films, it’s that Cars will never make sense. Every Cars movie that comes out only adds to the confusion, and the latest tidbits that’ll stick a potato in your tailpipe have to do with why there are no motorcycles in Cars world, but there are fairy tales. While chatting with Cinema Blend, Cars creative director Jay Ward was asked about why there are no motorcycles in the Cars universe. This is a legitimate question. After all, if there are planes, tractors, and freakish Volkswagen Bugs with actual wings, why not motorcycles? Turns out, there actually was a plan to have Vespas in the second Cars movie, but there was nowhere to put their eyeballs. The problem is the eyes and the mouth. A motorcycle has one eye. It has a headlight, not headlights. So that’s difficult. Where do you put the eyes when they don’t have a windshield? ... And then the mouth is somewhere south of the headlight? It really is difficult to bring a motorcycle to life as a character. With the shape of a car, it’s like the head of a horse, or the head of a dog. It has a long snout, you can put the eyes back in the windshield, and it works very well to emote. This raises a whole new set of questions on top of all the other questions we’ve been agonizing over forever. Why couldn’t they just add a windshield for the motorcycles? A lot of them have windscreens. If their eyes could’ve been on their headlights instead, does this still explain why the brains are supposedly inside the cars, hence why the doors aren’t supposed to open because then the brains would fall out? And furthermore, why do the cars look like dogs if they’re supposed to be the AI embodiments of their dead human owners? Yes, those are all questions we have as a result of actual quotes about the world of Cars. That eyeball quote might explain the loss of one thing, but there’s also the addition of something else. In Cars 3, you can spot Cinderella’s carriage on a shelf of trophies in Mr. Sterling’s office. Ward told Cinema Blend this was something the set department did without his knowledge, but that it’s one of his favorite hidden extras in the flick. Normally, that would just be an Easter egg, but as we all know there is no such thing as normal in Cars. Now, we have to imagine what the Disney universe is like in this freaky, freaky world. Is Cinderella just about a pumpkin carriage that lost a glass hubcap? What about Merida from Brave? Is she a spirited scorpio that her parents tried to marry to a trebuchet? Does Tiana turn into a lime-green AMC Gremlin in The Princess and the Lemon, while Doctor Facilier sends a bunch of Ferngully-esque smog demons to apprehend her boyfriend? Oh man, I could easily make a whole franchise of Disney movies set in the Cars universe. Sometimes, in the face of insanity, you have to make your own truth.